Gas Chromatography Mass Spectrometry (GC-MS) is known to be limited in the analysis of polar organic compounds such as free acids and bases which require derivatization for their proper analysis. The problem in free acids analysis emerges from extended peak tailing at the GC separation column (and liner) as well as peak tailing and sample compound degradation at the metallic surfaces of the ion source. Recently, a few of the major column vendors introduced new brands of inert columns and liners that alleviates and significantly reduces column related peak tailing by polar compounds. However, the problem of ion source activity remained unsolved and it is currently the main reason why free fatty acids and other polar organic compounds cannot be properly analyzed by standard GC-MS and require derivatization. While derivatization enables the GC-MS analysis of polar compounds such as fatty acids, it requires another step in the sample preparation. Furthermore, derivatization is not always practical since for a large variety of sample types the presence of compounds that require derivatization is not known hence they are analyze without derivatization and in such cases important sample information on such polar compounds is lost. In this Advanced GC-MS Blog post we describe the analysis of an anti foam agent which in this case is hydrocarbon based oil that also contains free fatty acids. However, the presence of these free fatty acids was not initially known. Keep reading to find out how the 5975-SMB GC-MS with Cold EI uniquely enables the analysis of free underivatized fatty acids which could not be properly analyzed by standard GC-MS. The analytical conditions given below pertains to the 5975-SMB GC-MS with Cold EI while Standard Agilent 5975C was used at Veolia France at its standard operational conditions (30 m column and 1 ml/min column flow rate) and served for comparison with GC-MS with Cold EI. Systems: 5975-SMB GC-MS with Cold EI system of Aviv Analytical which is based on the combination of Agilent 5975 MSD with the Aviv Analytical Cold EI with its supersonic molecular beam interface and fly-through Cold EI ion source. Injector: 280ºC injector temperature with Pulsed Splitless injection at 30 PSIG (15 ml/min). The liner did not have glass wool. Samples: Anti foam liquid which is a white milky viscous liquid in its appearance, as used by Veolia and diluted at 1% in methanol. Columns: 8 m 0.25 mm ID, 0.25µ film of DB-5MS UI. He column flow rate: 2 ml/min for 11 minutes followed by flow program to 12 ml/min at 2.5 ml/min.min. Oven: 50ºC with wait one min followed by 20ºC/min to 330ºC and wait 5 min for total of 20 min. SMB source: 12 mA emission, 700 mBar nozzle backing pressure, 62 ml/min total He flow rate (column plus make up at 250ºC transfer line temperature). SMB transferline temperature: 250ºC with temperature program of 10ºC/min after 5 min to 330ºC. Electron Energy: 70 eV for both. 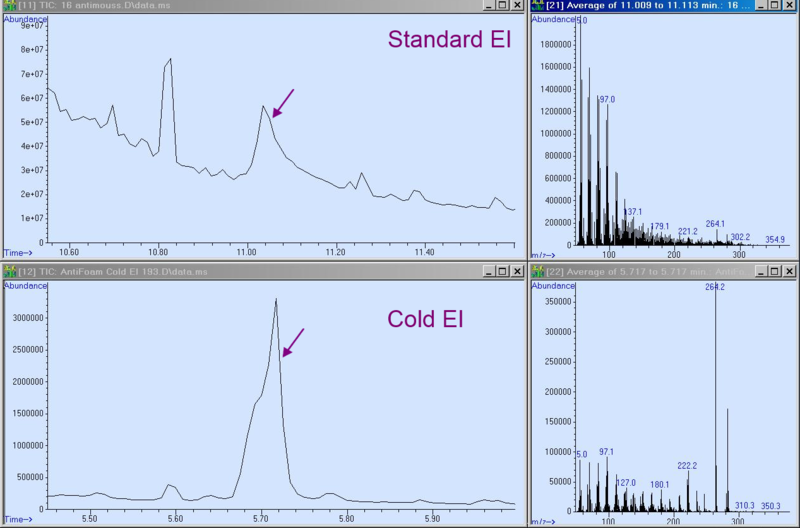 The anti foam liquid was analyzed by both standard GC-MS and GC-MS with Cold EI and in Figure 1 we show and compare the results obtained using the 5975-SMB GC-MS with Cold EI and standard Agilent 5975. In this note we focus only on the portion of the mass chromatogram where the free fatty acids eluted while other details of this anti foam oil can be available on request. Few observations are demonstrated in Figures 1 and Figure 2 that further illuminates the obtained Cold EI mass spectra and its NIST library identification. The ratio of Cold EI fatty acids peak to the hydrocarbon peak that elutes just before it is higher by a factor of almost 20 times in Cold EI in comparison with standard EI. Thus, clearly the free fatty acids are mostly degraded and/or tailing in the standard EI ion source and their quantitative determination becomes practically impossible, while Cold EI with its fly-through ion source provides uniform response also to free acids. The Cold EI peak shows a clear shoulder of near co-elution of two acids while this almost separation is fully eroded in standard EI due to peak tailing. 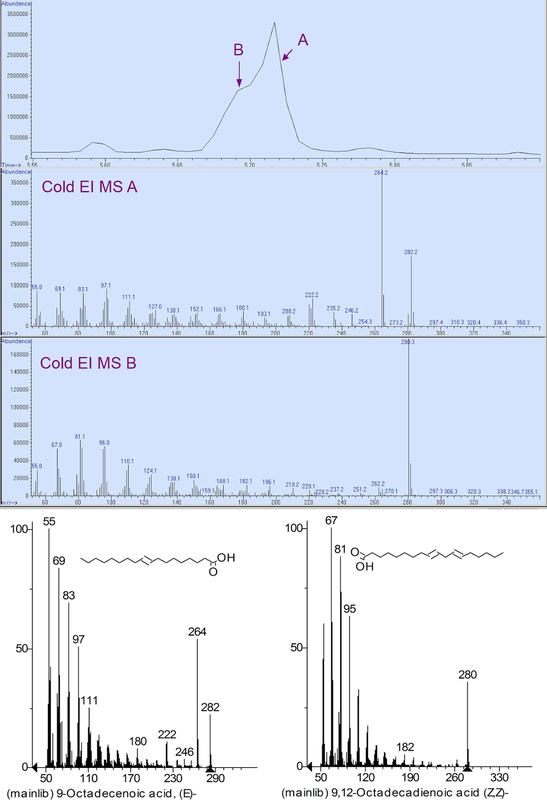 The Cold EI mass spectra resulted in clear NIST library identification of the acids as 9-Octadecenoic acid (C18H34O2) and linoleic acid (C18H32O2) although the identification at the isomer level can not be fully trusted. On the other hand, attempted NIST library identification of the standard EI mass spectra failed. Cold EI provides enhanced molecular ions but in its NIST identification the library finds a standard EI mass spectrum that was obtained at a low ion source temperature thus with higher than usual molecular ion hence with good fit. The Cold EI mass spectra are cleaner than the standard EI mass spectra and also exhibit useful high mass fragments. Few additional free fatty acids were detected at lower concentrations and identified while their detection and identification failed in standard EI. For example, the small peak eluting at 5.78 min was identified as octadecanoic acid. In conclusion: The 5975-SMB GC-MS with Cold EI uniquely enables effective free fatty acids analysis in complex mixtures such as anti foam liquid oil. We previously demonstrated the analysis of free fatty acids in another Blog post that describes the detection and identification of branched free fatty acids in ant heads. Cold EI is characterized by the full elimination of any ion source peak tailing and/or degradation and it provides enhanced molecular ions while retaining effective library identification. Figure 1. 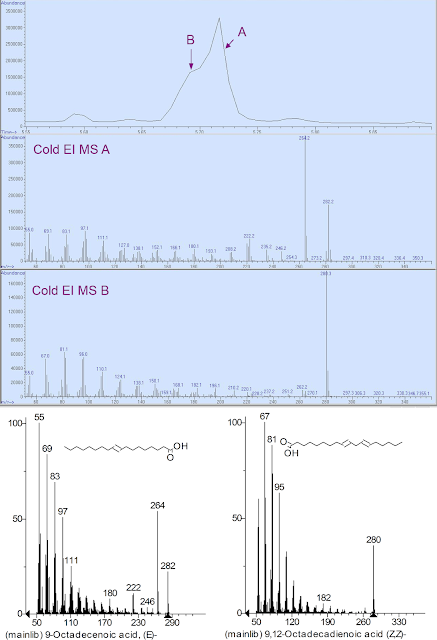 Mass chromatograms of the Veolia used Anti Foam liquid using the Aviv Analytical 5975-SMB GC-MS with Cold EI (bottom TIC mass chromatogram) and standard Agilent 5975C GC-MS at Veolia (upper TIC chromatogram). These mass chromatograms are zoomed around the elution times of the free fatty acids peaks. The observed Cold EI mass spectrum of the right side of the peak is given in the bottom right mass spectrum and that of standard EI in the upper right mass spectrum (5.72 min in Cold EI and 11.1 min in standard EI). Click Image to Enlarge. Figure 2. The analysis of free fatty acids with GC-MS with Cold EI. The upper total ion mass chromatogram shows the peak of the two nearly co-eluting fatty acids. The middle mass spectrum A shows the Cold EI mass spectrum of the free fatty acid that eluted at the right side while the bottom Cold EI mass spectrum B is of the free fatty acid that eluted at the left side of the peak. Clearly, two different acids were detected and as at the bottom of the Figure their NIST library MS are very similar hence enables the identification of acid A as the unsaturated Octadecenoic acid (left NIST MS) while acid B is the doubly unsaturated linoleic acid C18H32O2 (right NIST MS). Click Image to Enlarge.